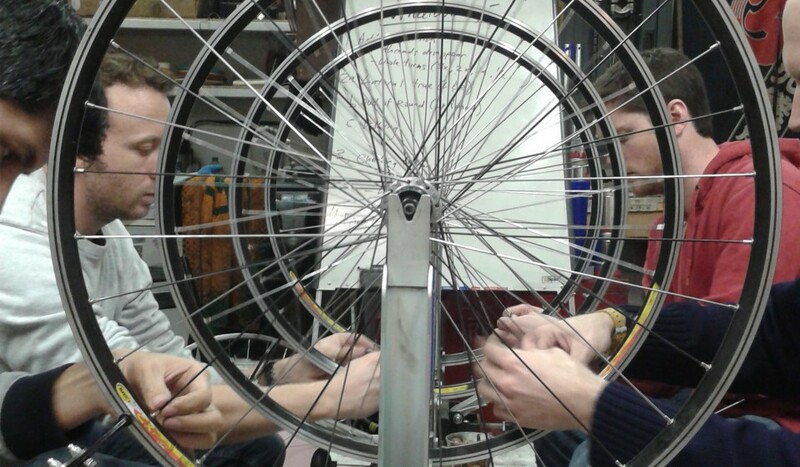 London Bike Kitchen is an open DIY cycle workshop in Hackney where anyone can learn to fix their bike. Jenni Gwiazdowski wanted to build her own bike, but had no idea where to start until a friend suggested going to a bike kitchen. Bike kitchens are community bike maintenance cooperatives that allow members to take their bikes along to the workshop to make use of all the tools and expertise on hand. The idea started on the US’s West Coast and is also popular in parts of Europe, but hadn’t yet found its way to London. Jenni loved the idea of an open workshop where people could fix their own bikes, so she decided to fill the void and set one up in Hackney, North London. 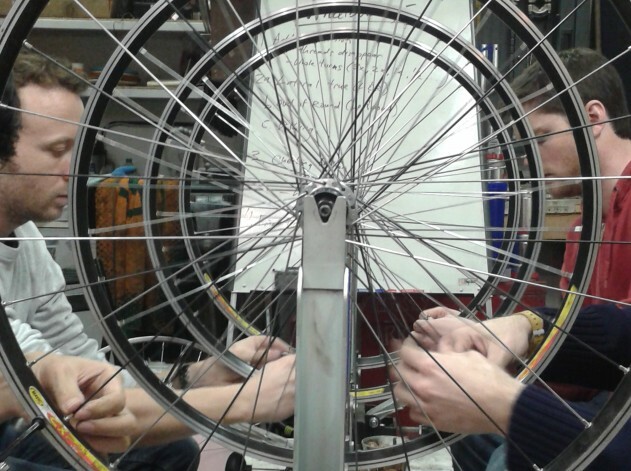 The London Bike Kitchen is now a thriving hub of DIY bike repair that offers courses in bike building and other aspects of cycle maintenance, as well as drop-in repair sessions. London Bike Kitchen will be exhibiting at Spin London, the urban cycling festival at The Truman Brewery that starts today and runs to Sunday 30 March. Huck spoke to Jenni to find out more about the project. I’m the founder and director of the London Bike Kitchen, but I wear many hats: I do the finance, marketing, admin, ordering, cleaning, networking…and even find some time to teach and help people with their bikes. I manage a team of about 10 mechanics, some volunteers, some paid, but all teachers here at the workshop. Why did you start London Bike Kitchen? It started out with a selfish desire to learn how to build my own bike, but I had no idea how to do it or where to begin. I googled bike building classes but there weren’t any. My new flatmate at the time was a fellow Californian and asked if we had a Bike Kitchen in London. My interest was piqued – the more I researched, the more I thought, “I bet I could set one up…” and the rest is history. I want people to feel empowered! I want people to think, “I don’t know how to do that now, but I can learn.” And not just about bikes, but about anything. What’s the existing scene like? Currently, in the shop, the majority of people that come in are 20-30 year old males. They’re super keen and want to learn as much as possible – which is great! But I want to get more women in. We do a Women and Gender-variant (WaG) night every 2nd and 4th Monday of the month in order to provide a safe space for people to learn about bikes in an environment that encourages not knowing things and asking questions. In an ideal world, we wouldn’t have a WaG night, but the reality is that women are generally not encouraged to pick up tools when they’re young, and so they grow up without a clue as to how to use a spanner. Who’s involved in London Bike Kitchen and what does everyone do? We have a group of about ten mechanics. Most of us work drop-in sessions where we advise people on how to fix their own bike. A chunk of us teach classes, and another chunk run our women and gender-variant (WaG) night. Some of us are on the steering group (soon to be board of directors), and a couple work with local schools, teaching students and young offenders. What have been the challenges in bringing London Bike Kitchen to life? Time, money, and space have definitely been the biggest challenges. I started this up while working a full time job at a charity, so I spent all my free time setting up everything, basically sacrificing my social life. I managed to get a one-off grant from the London Cycling Campaign to pay for shop tools, and crowd-funded for shop fittings. We’ve got a bit of a compromise with space – we’re in a good location, but there’s not much room. The shop is small, but mighty! Learning about other bike projects around the world and how they help out their local communities has been very inspiring. Just meeting people who are inspired by us is inspiring for us! Also meeting Ellie Smith from the recently set up Broken Spoke Bike Co-op in Oxford – we were basically doing the same thing at the same time, and we really depended on each other for advice and ideas. What’s the future for London Bike Kitchen? At the moment I’m really focusing on getting a new internal structure set up so that the organisation isn’t dependent on me for everything. It’s been really stressful over the past three years and it’s time to spread the load. Once we get a good board together, I’m looking forward to possibly finding a second space, or moving everything into a larger building. Oh, and maybe incorporate frame building courses into our space with The Bicycle Academy as well. Find out more about about London Bike Kitchen or catch them at Spin London urban cycling festival, this weekend at Truman Brewery. 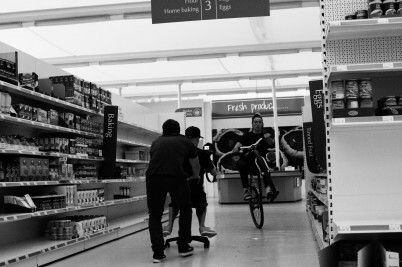 Bristol's spirited fixed gear scene gets the star treatment in this rad mini doc. London bike company co-founder Will Meyer shows us his two-wheeled commute. They pedal, push and scramble their way through mounds of mud and storms of dust. Welcome to the messy world of cyclocross. 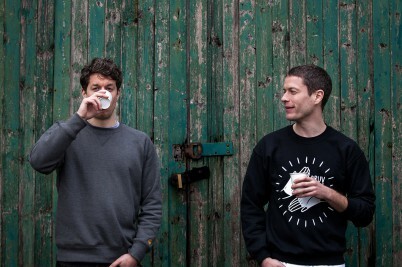 As part of our HUCK Indies 2013 exhibition, we meet the London-based bike company, Brother Cycles. 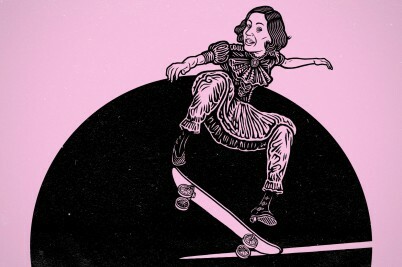 An inquest into gender bias in sport and why society thinks women shouldn’t skate. 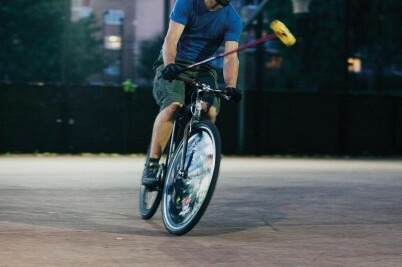 Put the ponies out to pasture, leave your pretence at the door: hardcourt bike polo is not a blue-blooded sport.